When we start talking about her most recent project, a standard bathroom for a hotel chain, Ursula Fuss immediately and passionately is in her element: “Society,” the architect says, “knows too little about the needs of people whose mobility is restricted. Which is why the focus is on assistance to help solve the problems caused by the restrictions instead of thinking about the sequences of movements and bringing this to bear as the design brief for the architectural concept.” Fuss knows what she’s talking about. She is herself confined to a wheelchair. As an architect she wants to think and conceive of architecture that does not restrict anyone. Which is something architects do much too rarely, as they prefer to hide behind DIN standards or to add ramps, wall rails and other helpful auxiliaries to existing spaces. The bathroom Ursula Fuss has developed is a successful example of just how her principle can be put into practice. Because it is primarily a well-designed room in which you feel good. Only on closer inspection do you notice what benefits certain details offer people whose mobility is restricted. For example, the seat and surrounds of the curved bath tub section. The sides have inbuilt shelves that are ideal not only for bath salts, cosmetics and all the other stuff, but also as support when getting in and out of the tub, or as seats. 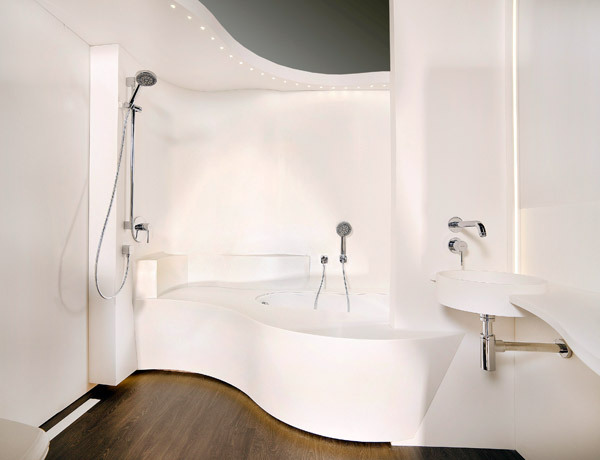 And the curved side walls of the tub are likewise not the product of some zest for graceful shapes, but create turning space for your wheelchair in two different points in the room, despite it having a footprint of only six square meters. Fuss has also consciously eschewed any shower enclosure. 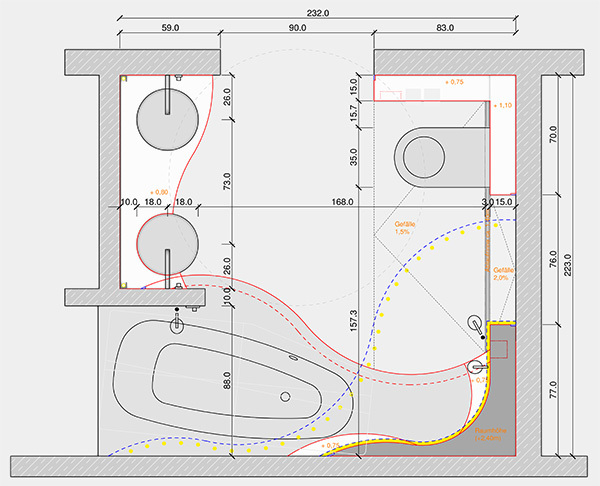 She explains that “even with shower stalls that are set flush with the floor, the sheer fact there is a partition limits freedom of movement.” For this reason, the shower section is positioned next to the toilet, which can after all get wet. And if you need to use the toilet, then it’s easy to place your wheelchair on the shower space. To make sure all the cosmetic on the washstand stay dry, Fuss has positioned it opposite the toilet. Meaning you don’t have to roll the wheelchair back and forth a lot to get from the toilet to the washbasin. 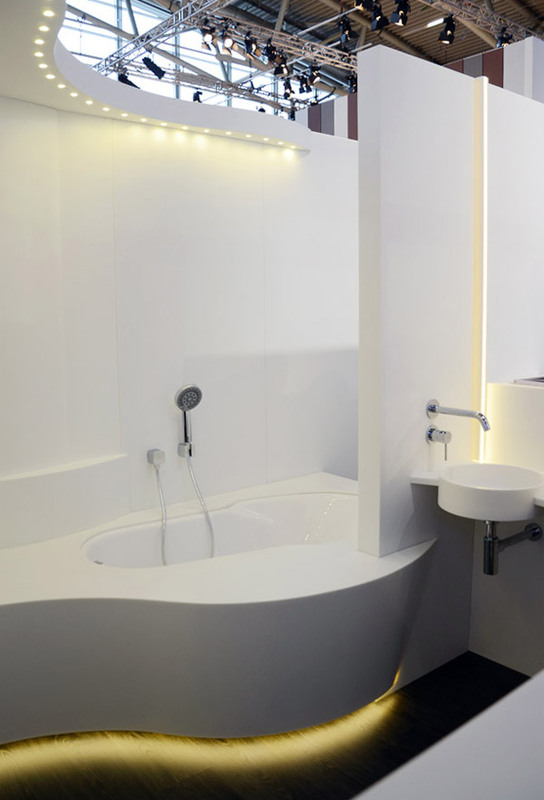 The bathroom concept is a joint project by Ursula Fuss and Samsung SDI – and shows the design potential that Staron mineral composites offer. The prototype will be on show at booth C43 in Hall 3.0 at the ISH 2015.